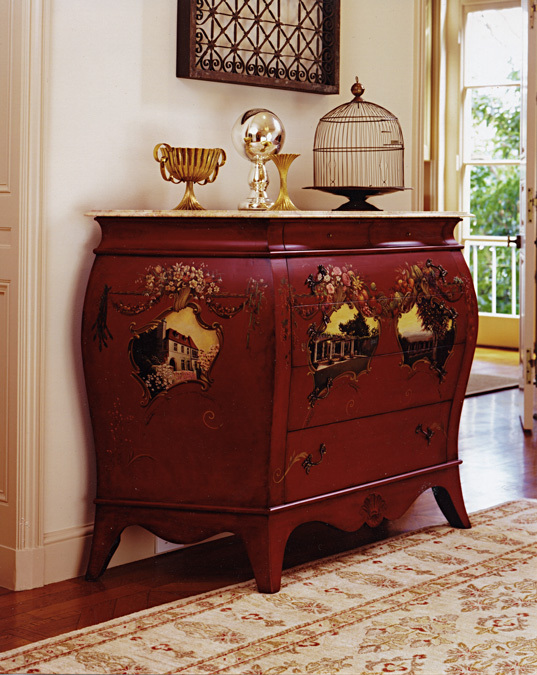 The clients wanted a Bombé style chest that would incorporate their horticultural and culinary passions, as well as some of the features of the house, its surroundings, and personal details of their lives there. It was important that it be a very personal piece as they intend it to become a family heirloom for future generations. We came up with a four seasons motif as a vehicle to show the house and garden, and decided to weave in small symbols to represent family celebrations throughout the year. The left side is Spring, with a view of the house surrounded by blossoming fruit trees. The swags crowning the cartouche with the house are composed of spring flowers and vegetables found in their garden. The front of the chest represents Summer and Fall with views of the rear and side gardens, again garlanded with flowers, fruits and vegetables of the seasons depicted. The right side depicts winter. Each scene has little hidden surprises for the couple's young children to find. There is even a witch on a broom discreetly hidden in the Fall vignette. A final touch was the tromp l'oeil scallop on the front apron which is copied from a carved marble fireplace in the adjacent room. The chest was designed and built by Matthias Murer. The shape is based on, but not a copy of, 18th century French commodes. The top is a piece of Italian marble which we chose to compliment the color scheme of the chest.